With the start of our first season of Motorbike Rental-Dubai we started looking for a cover photo that sums up the amazing landscape of the desert in Dubai. More information about our off-road desert safari adventure tours or bookings contact us via our contact form or just send us a whatsapp message for a quick reply. The advanced Dirt bike-tour is for riders who have off-road riding experience. It involves a 4 hours’ Dirt bike-desert-tour to enhance your skills. You will be taught how to ride steadily in the desert during changing dune conditions. An experienced tour guide will available to guide you through the trip; you will also be provided with all necessary safety equipment in this open-desert-safari-tour. If you wish to explore and have fun the desert by yourself or with your friends, the custom Dirt bike tour is a fit for you. The package is available for up to 2 days in which you will be provided with Desert Camp for an overnight stay. It also includes the development and design of the riding route. 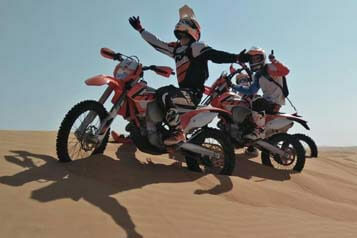 Dirt bike rental in Dubai offers an excellent opportunity to experience the fun of desert riding. Whether you are a beginner or a skilled rider, you are sure to have a unforgettable experience. More information about our off-road-desert safari adventure-tours, private or custom sand dune tour, group long ride open desert tour or bookings contact us via our contact form or just send us a whatsapp message for a quick reply. Group adventures are often booked at DunebikeDubai. 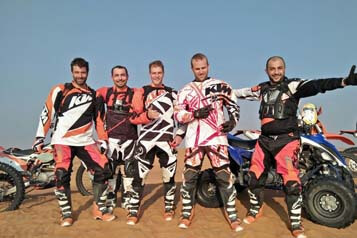 To experience the desert sand dunes on a motorbike-rent-Dubai with your friends makes it a unique experience. And besides all our other desert activities such as Dirt Bike tours, Polaris RZR Dune Buggy-Tours, and Quad Bike Tours the motorbike rent Dubai group experience is most popular. The adventure doesn´t end after your motorbike tour, we welcome you in a big 5 star desert camp with lots of other attractions from belly dancers, fire show and horse riding in the desert. Every night you can enjoy the big BBQ dinner with fish, lamb, beef and a wide selection vegetarian offers. So get your friends ready and rent a motorbike in Dubai for the ultimate dune bashing experience. More information about our off-road-desert safari adventure-tours, private or custom sand-dune-tour, group long ride open-desert tour or bookings contact us via our contact form or just send us a whatsapp message for a quick reply. Chris Ball reviewed Dunebikedubai – Desert Motorbike Tours and Buggy Rental Dubai – 5 star 16 December 2016 · I am an experienced rider, the tour guide really accommodated us and all of the bikes and gear were first grade. We will 100% be going back. Biking, when compared to other racing, is full of excitement and on-road adventures. It signifies freedom and self-sufficiency. If you want to relish the overwhelming feeling and experiences associated with riding, consider motorbike rental in Dubai-UAE. Enjoy the experience of riding with a motorbike-rental in Dubai companies available. Worried about safety? You will be provided with protective gears and all necessary safety equipment and the option of an insurance coverage. Whether you are a beginner or a skilled rider, there are different tour options offered by motorbike-rental-Dubai companies. More information about our off-road-desert safari adventure-tours, private or custom sand-dune-tour, group long ride open desert tour or bookings contact us via our contact form or just send us a whatsapp message for a quick reply. If you are eager to experience the burst of adrenaline or you simply fancy the idea of touring the desert on your dream, look no further than motorbike-rental-Dubai companies. There are varieties of high quality bikes ranging 2016 KTM models or 2017 KTM 500cc which you can select from various motorbike rental Dubai companies. There are numerous services available for every rider. You will be provided with highly skilled professionals to guide you through the tour. With motorbike-rental Dubai you are sure to have an unforgettable experience..
More information or bookings contact us via our contact form or just send us a whatsapp message for a quick reply. This Adventure Tour is for Beginners with basic experience about motorbike-riding. If you have never experience off-road riding and have a burning desire to relish the fun of desert riding, this adventure tour is perfect for you. 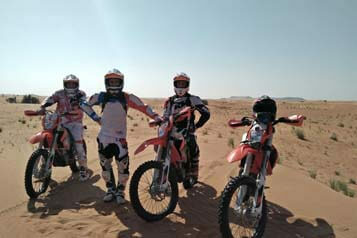 The package is a 2 hours tour where you will be taught how to ride a dirt-bike in Dubai off-road to improve your skills. You will be taken through an orientation on a dirt bike, basic controlling of dirt bike and off-road-riding. During the tour, you can experience the fun of desert riding with the best dirt-bike in Dubai. You will also be accompanied by a highly-skilled instructor to help grow your confidence and skills. Protective gears and necessary safety equipment will also be provided. You will be taken through an orientation of dirt bike, basic controlling of dirt bike and off-road riding. More info about motorbike hire Dubai or bookings contact us via our contact form or just send us a whatsapp message for a quick reply.